Hi Caliber Manufacturing is dedicated to making your most prized possessions a work of art. Whether its for your car, boat, golf cart or firearm, Hi Caliber Manufacturing can create a unique solution for you. Hi Caliber is focused on providing exceptional customer service and stands behind their work. Hi Caliber Manufacturing offers Hydrographics, Cera Kote/Dura Coat and Anodizing services. Ashland Gun Innovations is a small family owned and operated business. Charlie Baltz is the gunsmith while his daughter and owner Katie runs the books and front office. Charlie has been a gunsmith and in Ashland,VA since 1981 after training at the Colorado School of Trade. Charlie has been very active in the local shooting and hunting community from general repair, custom rifles, silhouette handguns and specalizing in CNC custom turkey and buckshot chokes and custom longrange muzzleloaders.. Whether you are looking for a class III dealer for transfers, to buy or sell NFA firearms, or a reputable Class II manufacturer you have come to the right place. All the dealers listed on our site are valid FFL/SOT holders and can help you with the purchase or sale of machine guns, silencers, and destructive devices. We also have free posting boards for buying or selling firearms and accessories. Sundown Outdoors is a group of friends who enjoy hunting. Many of us have been hunting together for over 15 years. We offer free, safe, and ethical predator removal service to homeowners and farmers who don't have the means to take care of the issue themselves. We have helped countless farmers decrease their losses due to predators. We specialize in coyote, fox, and bobcat removal, but we also remove possums, raccoons, groundhogs, and other small-nuisance animals. In most cases, we can respond within 24 hours. We will travel anywhere in Virginia to take care of your predator issues. We love going to tournaments where we can show our talents, perform our best, and promote the sport with pride and professionalism. NFA Gun Trusts by Arsenal Attorneys. Protect yourself and those who handle or inherit your guns with a personalized NFA gun trust by Arsenal Attorneys. 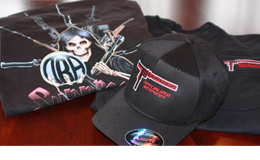 Visit our GEAR page to get your hands on all the latest apparel from TBA Suppressors. Also check out our suppressor pouches to protect your investment.